Since 2016 the Blue Angels have had the unique privilege of demonstrating to the Second Life public the precision techniques of Naval Aviation, hoping to inspire a culture of excellence and service to country. 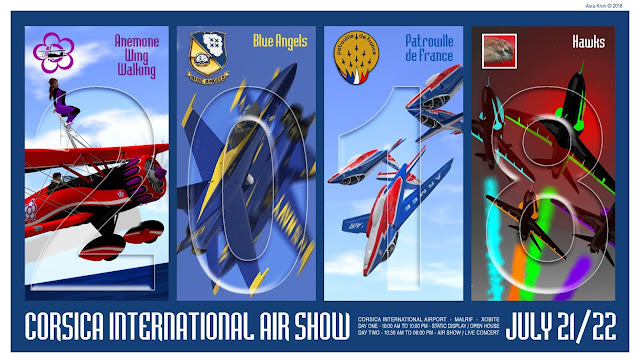 We are honored to make a quick detour from our FIRST SECOND WORLD TOUR in progress and jump to Corsica from France where we currently are located for this unprecedented Blue Angels event (see here for the first stop of the BLUE ANGELS FIRST SECOND WORLD TOUR!). Aircraft: Lockheed C-130T Hercules "Fat Albert"
Open House day - all areas accessible. 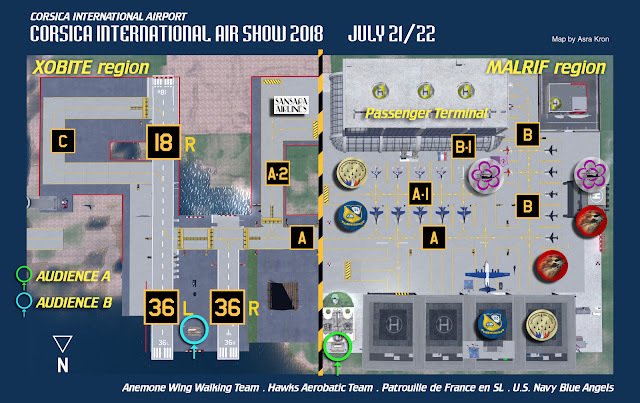 Static display of all the aircraft involved in the air show with fly ins by airlines and helicopter rides around the SLCI perimeter (air show level - 350 meters alt). Press conferences held by the demonstration teams at their assigned SLCI locations at scheduled times. This initiative is optional - Teams can skip the press conferences if they wish. Scheduled press conferences show below. Fly in display of interesting aircraft open to all. Happening at the GTFO level of SLCI (below the air show level) during all day one hours. Party will take place in the Glass Terminal - passenger terminal - at SLCI, Marlif sim. Fireworks provided by Chris Azrikam, Roleplay & Rides owner. Please arrive early and use the AUDIENCE assigned locations! After show party with LIVE concert. 16:00 hours (04:00 pm) Lexus Melodie sings live.